Back in November 2002, we went to Blackpool for the day and visited Louis Tussaud’s Waxworks. Some of the waxwork models were so poor that I couldn’t resist taking photos of the best (and worst) examples to put on my website. I soon created the Waxwork Quiz which has now had almost 500 people attempting to complete it – but only 6 people have managed to guess 12/12 correctly! Just over two years later, in November 2004, I was contacted by the producer of ITV’s Today with Des and Mel. Of course, I obliged, but only on the condition that I got a name check, a link to my website from theirs and a signed photo of Des and Mel. The photos appeared on the show on Friday, 26 November 2004, but it was a total disaster. Not only did they call me “Tony Roscoe” but when they tried to get the studio audience to guess who the waxworks were of, someone in the audience managed to guess every single one correctly! (I can only assume that they’d either visited my website before or had been to Louis Tussaud’s themselves!) To add insult to injury, they then said that I’d emailed the photos in to them! Honestly – as if I’d be so sad as to email photos into a daytime TV programme. Their producer had practically begged me to use them!!! A few weeks later, I finally received my “signed” photo. I say “signed” in the loosest possible sense since it was a digital print of a photo that had been signed. What absolute rubbish! Anyway, I’d just about managed to get over that episode in my life and then all the bad memories came flooding back to me today when I was contacted by a researcher for a new Channel 4 “comedy panel show” who also wanted to use my photos! Again, I’ve obliged, but this time they can’t give credits for any pictures (apparently). But after last time’s efforts, that’s probably for the best. The show is called “Best of the Worst” (or something like that) and should air towards the end of June 2006, so keep you eyes peeled in case my photos make it to the final edit! So what’s my problem then? Well, I don’t have any problems with the concept of Chip and PIN, as such. 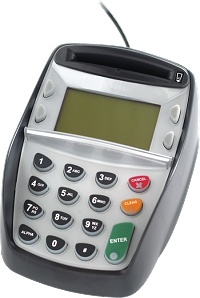 I do, however, have issues quite specifically with the Ingenico 3300 PIN Pad terminals. For some reason, whenever I try to use any of my Chip and PIN enabled credit or debit cards in these terminals, they refuse them almost without exception. Without fail, no matter which till I would choose at ASDA each week, my credit card would always get rejected. (This was back in the days when they’d just swipe the card and let you sign for it, but that’s not allowed anymore.) I’ve even replaced all my cards in the past and tried to pay with brand new ones without any success. Recently at Somerfield, where they were using the same Ingenico terminals, I was faced with one of those embarrassing situations where I’d packed my shopping bags and I was then told that my card wasn’t accepted. If it was my card at fault then that would be fair enough – but when the problem lies with their faulty equipment, that just makes me mad. We do carry out rigorous tests on our terminals and these are carried out to industry standards. We are not aware of this fault being a widely experienced one. We can only apologise and suggest that you contact your bank and advise them of the problems you have been experiencing with your cards. What is that supposed to mean? Are they saying that they’re not aware of the fault at all, or are they saying that they are aware of the fault, but they’re just not aware that the fault is a widely experienced one?!? Maybe Ingenico’s terminals aren’t faulty. Maybe the supermarkets aren’t looking after them properly. Maybe my cards are bent or dirty. But when every other shop I visit accepts them without any problems, I fail to see why I should be made to look like a fool at the supermarket checkout. Anyway, regardless of Ingenico’s intentionally ambiguous response, what should be done about this? Perhaps supermarkets should authorize your payment card as soon as you enter the store before you even start shopping; they could have a “Checkin” as well as a “Checkout”. If they did this, I wouldn’t waste my time carefully selecting items from their shelves, loading them onto the conveyor belt and packing them into carrier bags only to be told that I can’t take them because my card their equipment is faulty! Being male, I realise that I shouldn’t admit to liking Ikea. I should probably even have a stack of excuses already prepared just in case the missus suggests we go there, especially if the suggested day is a Sunday or – God forbid – a Bank Holiday. In fact, I even know someone who suggests that he and the wife should go to Ikea just to gain some bonus “husband points” when he’s running low on them. Anyway, I like Ikea, and since we needed some bits for the house (a blind for the bathroom, a light for the bedroom, etc.) I suggested we went there yesterday. It’s not as bad as everyone makes out. I mean, you get a free pencil each time you visit, maybe even two or three if you’re lucky! The furniture is also cheaper than most other places, so you actually save quite a bit of money. Also, the 10 meatballs meal (usually £3.25) was on a buy one get one free offer yesterday. This meant you could buy 20 meatballs for £3.25 – that’s fifty whole English pence cheaper than the 15 meatballs meal (£3.75)! Naturally, I had two meals to myself, whereas Suzy preferred to pay 50p more for less food... I know, I don’t understand women’s logic either. After eating some of that Ikea Dime bar cake stuff – which is more accurately known as ALMONDY Almond Cake with DAIM® – we decided to buy a couple of them from their Swedish shop. The sign said they were £2.75 each. We bought two. But when we got to the checkout, we were only charged £5.00! It turns out there was a special (secret) combo offer that nobody knew about – not even the checkout operator! Now, if Ikea gave out Nectar points, I’d be there every weekend!!! As always, Chris is right. I’m a part time blogger! Admittedly, there are a few things that have grabbed my attention over the past couple of weeks that I probably should have blogged about, so I’m going to cover them all now to try and keep him (and you) happy. At this point it’s probably worth noting that despite what some people think, Help A Hallam Child doesn’t raise money for the poor kids who can’t afford to go to a proper university and have to put up with the nearby special needs uni; it’s a real charity that helps children who are sick or live in situations of abuse, neglect or deprivation. If you’re ever near Torquay in Devon and want some good fish and chips, visit Hanburys Licensed Fish Restaurant & Seafood Takeaway. They are (or once were) one of the top three fish and chip shops in the UK! We ate in their characterful restaurant but I assume you still get the same high-quality food from their takeaway next door. We’ve finally got a new bathroom (with a proper door so that you’ve no need to be paranoid about someone peeping through the gap at you).